The stage to Ivrea is like New Year’s Day: everyone is just taking it in after the party (and rest day). There is a lot of time to do so: the riders must cover 237km between Valloire in France and Ivrea in north-west Italy. 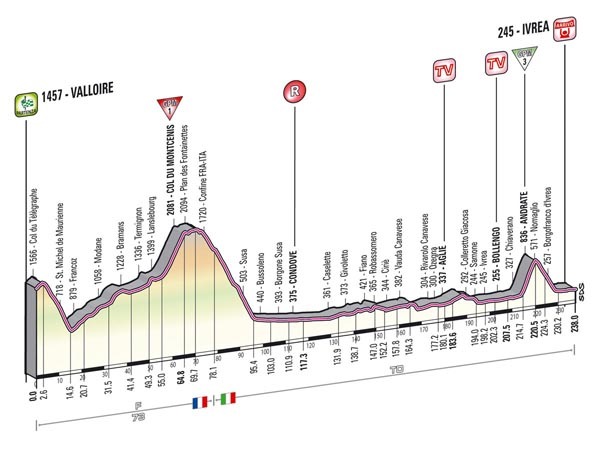 Amazingly, this is the third day for a stage in Piedmont. The Giro has come to neighbouring Biella and it has featured the Santuario di Oropa climb many times, but never Ivrea. The locals are likely to cheer someone winning from an escape. To leave France, the stage covers the same Mont Cenis climb. The long drag should produce an escape, and the smaller Andrate climb, 5.7km long, should fine-tune the move. Though Andrate comes only 16km from the line, the GC favourites won’t be bothered, as they are recovering from the weekend and facing a few more high-mountain stages. Though oranges are not grown nearby, every year during carnival the city erupts into a battle with the fruit. The tradition grew from folklore, which has it that a girl chopped the head off the local duke who insisted he had the right to sleep with newly-wed women. The oranges represent his head, and are chopped, of course, for entertainment.